We had planned to travel light – small trailer, only the basic stuff we need to live. How in the world did we wind up with a packed pickup truck, the Fireball filled with stuff, and the cab crammed with maps, books, coffee, dog, boots,and assorted electronics? Holy cow – how did we get to this point? 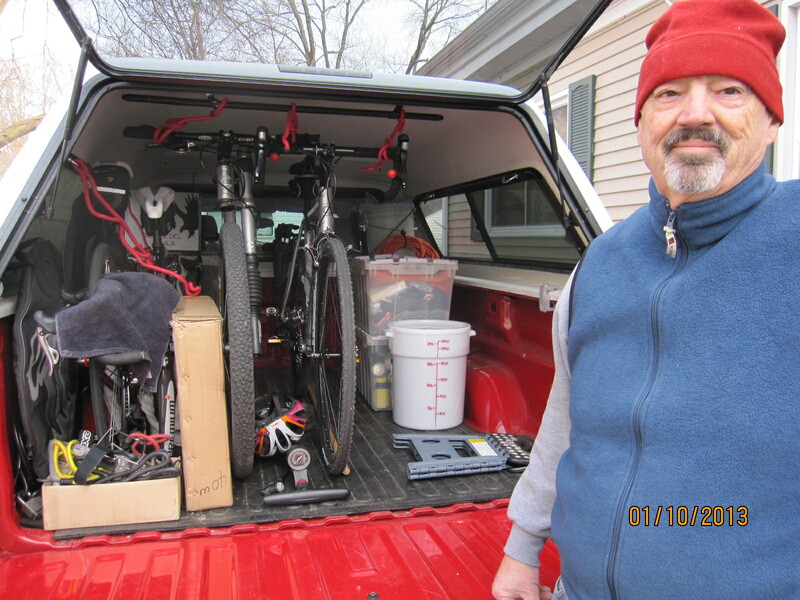 Guess it all starts with the fact that we have to travel with four bikes – a road bike for each of us, plus John’s cross bike, and my Lefty. Then, we’ve got a bin of clothes for each of us (very limited space inside the Fireball for same), a bin of foodstuffs, and one more of extra bike/hiking gear. The big white bucket is Jezzy’s food. After the photo was snapped, we loaded in our gigantic white cooler (mostly beer), and completed the packing. Yikes. The funny thing is that we would ideally each have one more bike with us. Not sure if we’ll ever manage that. This entry was posted in retirement, RV life, simple camping, T@DA and tagged RV life, simple camping, T@DA by Judy Crankshaw. Bookmark the permalink.